There is an absolute truth that mayonnaise is essential in a Paleo diet, simply because it makes everything taste better. Combine it with eggs and bacon, or with a few slices of prosciutto, and all will be right with the world, at least in those dreamy moments while you are consuming your tasteful lunch or dinner. After all, creamy, Paleo salads do exist, you just have to find the right proportions of the one you love the best. Of course, next to the mayonnaise, it is best to eat your greens, and in this case we are attached to scrumptious broccoli florets – organic if you can find it, slightly steamed, yet still crunchy for the best bites. If you are looking to up your vitamin C intake, but aren’t keen on eating too much fruit, know that just one cup of broccoli has as much vitamin C as an orange. Broccoli is high in fiber, it provides you with a giant boost of vitamin A, and it doesn’t only come in the most common green variety found in the grocery store. You’ll also find it in amazing shades of purple, seek and you shall find – then add it to your salad! We love meals that are ready in less than half and hour, and we know you do too. This is one of them, so get your eggs in the pot, the bacon in the pan and start cooking; everyone is counting on you to whip up something fast. Add the broccoli and cook for 5 to 6 minutes, just until broccoli is tender-crisp. Drain broccoli and place in a salad bowl. In a small bowl whisk together the mayonnaise, olive oil, apple cider vinegar, lemon juice, paprika, and season to taste. 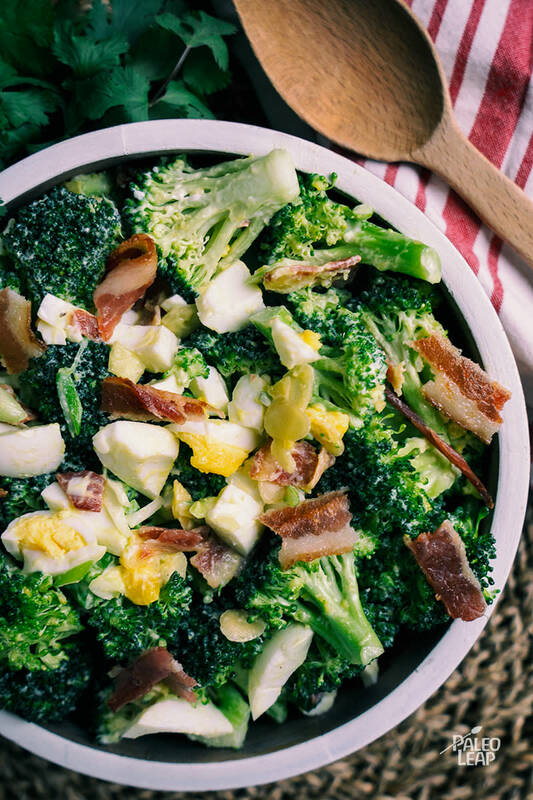 Add the green onions, bacon slices and eggs into the salad bowl with the broccoli. Pour the mayonnaise mixture over the salad and gently toss everything until well coated.